Great job, as always, although there are a few licenses missing Raleigh-Durham, NC F block in AWS in particular. Yeah, the metro mapper still is using that old FCC Dashboard data which has many issues. Very nice work. Is there some way to help with the metro stuff? Nothing unless you can convince the FCC to make an API for the ULS data that includes county level disaggregation data! Maybe you should be an FCC commissioner. Is there a reason why it shows for Sprint that they do not have 800 MHz SMR spectrum in the Los Angeles, San Diego, Phoenix, Tucson and San Antonio areas? They clearly have 800 MHz SMR spectrum in Los Angeles and all of the other areas mentioned along the Mexican border. Example of 800 MHz SMR spectrum in Los Angeles. The areas near the Mexican border have slightly different rules because the spectrum has to not interfere with transmissions on the same frequency in Mexico. They may show up in slightly different frequency bands. I understand and the FCC has already worked with the Mexican government on a 800 MHz reband plan that is already in effect. It is going to take some time for both sides to free up the necessary 800 MHz spectrum that allow Sprint to deploy CDMA and LTE. Also only part the southern part of Los Angeles is not covered by 800 MHz. 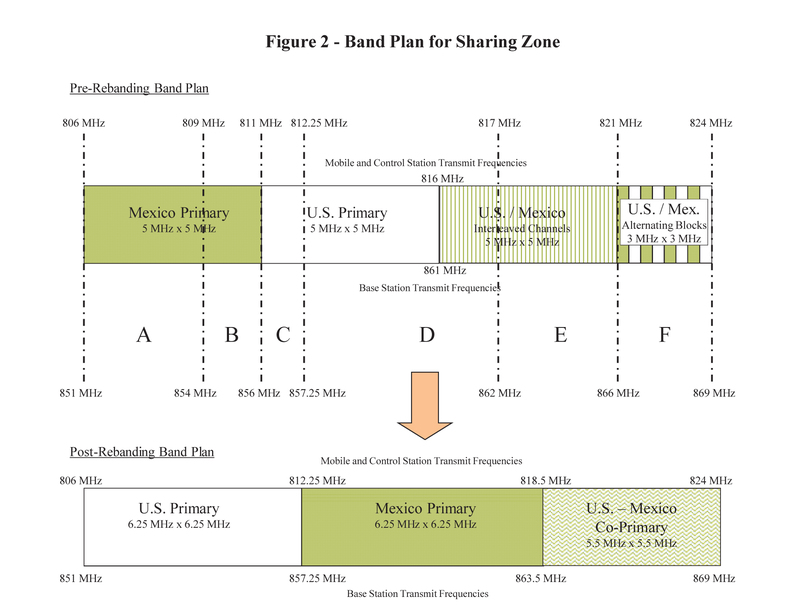 Approved 800 MHz reband plan for US/Mexico as of Aug 23, 2013.